CPT’s service dog program is highly customized and flexible, where we can locate, evaluate, and select a candidate dog optimal for a client’s program or train an existing pet. Furthermore, we can board train the dog, where a CPT Trainer prepares the dog from start to finish and then we instruct the recipient how to handle, care for, and manage the dog. Alternatively, with the CPT Hands-On Service Dog Program, we use a combination of group class, private instruction, in-home private instruction, and remote private instruction to educate the client how to train his/her dog, which is much less expensive than the board training program. 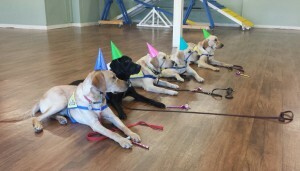 Celebrating Luther’s 1st birthday during the CCI Puppy Raiser Class. In addition, CPT has maintained a close to 15-year relationship with Canine Companions for Independence (CCI), the nation’s largest and most respected nonprofit service dog organization. 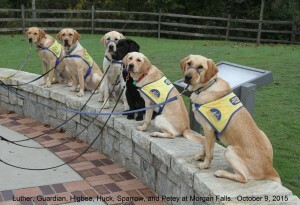 CPT has operated CCI’s Atlanta Puppy Raiser Classes for more than 14 years. 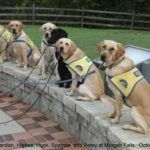 And via Dog Star Technologies, a company co-owned by CPT President Mark Spivak and Emory University neuroscience professor Gregory Berns, CPT participates in bi-coastal research that studies methodologies for improving the identification and training of service animals. CCI is a partner in two of Dog Star’s studies. CPT Trainer Patricia King leads the CCI Puppy Raiser Class in an outdoor sit-stay at Morgan Falls Park. Whereas CCI provides trained service dogs at no charge to disabled applicants, CPT trains service dogs for disabled persons with sufficient financial resources. In contrast to most nonprofit service animal entities that have comparatively long wait times for dogs, CPT can obtain and custom train a dog far more expeditiously. However, most CPT service dog clients will pay between $10,000 to $20,000 to board train a service animal or between $2,000 to $5,000 for the Hands-On Program. Therefore, CPT and CCI complement one another, whereby CPT meets the needs of disabled persons with financial means, which in turn enables disabled persons with lower incomes to more rapidly receive dogs from CCI. 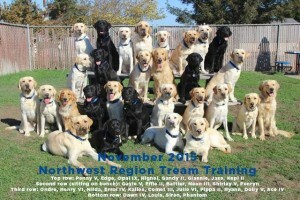 The November 2015 CCI Northwest Region graduates, many of whom participated in the Dog Star fMRI studies at UC Berkeley. CPT enjoys the challenges and the community value provided by service dog training. Similarly, CPT appreciates our relationship with CCI, the opportunity to help the puppy raisers, the opportunity to learn from CCI’s outstanding staff and administrators, and the opportunity to collaborate in research that expands the knowledge of the entire service dog field.